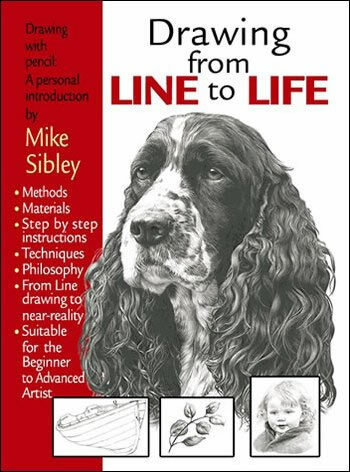 Mike Sibley has just released the second edition of his top selling book â€œDrawing from Line to Life.â€ Mike Sibley is one of the UKâ€™s premier canine artists, who works in the medium of pencil/graphite and has produced several top selling open and Limited Edition prints of canines and animals. 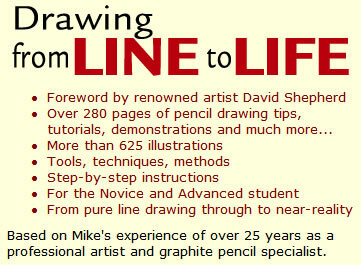 This 2nd edition now features a foreword by one the of the UK’s most famous living artists, David Shepherd. This book actually works on several levels: a step by step instructional guide on how to draw art with Pencil/Graphite, an account of how Mike Sibley actually produces his amazing limited editions that sell worldwide – with actual â€˜case studiesâ€™ of how he drew particular images and lastly it is a good collection of Mikeâ€™s actual work featuring more than 625 illustrations. I have spoken to Mike about this on several occasions and what is clear is the dedication, attention to detail and the actual man hours put into this book. Mike says it took over a year to complete and with the breath taking amount of detail in this book, I believe him. All these chapters are then broken down into several logical sub sections.